VR tech is getting real! There’s a common refrain in Germany, “This is the last Nazi trial.” The country keeps striving to hold Nazis from World War II, especially those who worked in concentration camps, accountable for their crimes against the world and against those Europeans that the Third Reich deemed undesirable. But as many camps were dismantled after the war and survivors of the camps are dying of old age, it’s hard to collect evidence against individuals for crimes perpetrated in the 1930s and 40s. But now, forensic virtual reality is helping jury members and judges see exactly what crime scenes, including concentration camps, looked like, and that’s helping German prosecutors go after former concentration camp guards and staff. This could allow Germany to assign culpability to perpetrators of the Holocaust until the last accomplice has died. Take the case of Reinhold Hanning. He was, undeniably, a guard at Auschwitz Concentration Camp. During Hanning’s time at the camp, 170,000 people were killed, most of them Jewish, most of them in gas chambers. As an SS sergeant, Hanning would likely have been involved in the “selection” process, where some prisoners were sent to the chambers and some to hard labor. But prosecutors had to prove that Hanning was involved in that process or that he knew the process resulted in hundreds of thousands of deaths. It wasn’t enough to prove that he was at the camp. It wasn’t enough to prove that he worked there. They had to prove that he knew his actions contributed to murder. If that was proven, he could be convicted as an accomplice to 170,000 murders. But, how do you prove that he must have known about the gas chambers and that he must have known what the results of their use were? After all, he claimed that he had never seen a prisoner gassed and that he didn’t know people were being killed. 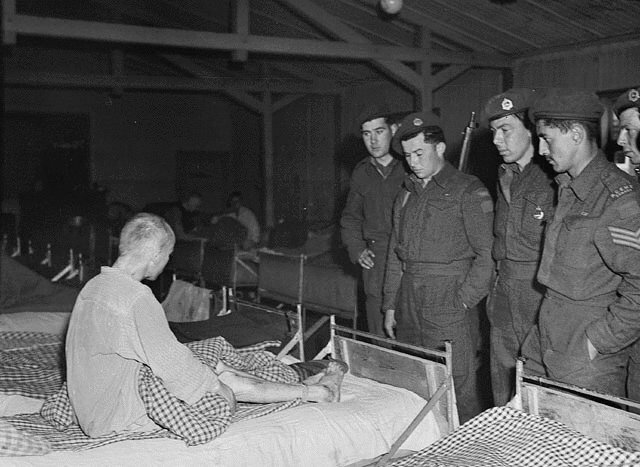 Prisoners in advanced state of starvation in a concentration camp liberated by the 3rd Canadian Infantry Division, Sergeant Lucien Lapierre of the New Brunswick North Shore Regiment. And, nearly all the records from the time have been lost or destroyed. And most of the camp was either torn down or has fallen apart in the years since World War II. While some concentration camps survive today, that is because they’ve been maintained as museums and memorials to the atrocities. The camps were not designed or constructed to last 100 years. But prosecutors had a modern tool in their arsenal for prosecuting murderers and other criminals in the modern day: forensic virtual reality. Experts went to crime scenes and imaged the site with lasers, digitally recreating the area in 3D down to the blood splatters on the walls. Prosecutors asked the experts if they could recreate a concentration camp, instead. Engineers turned to maps of the camp and compared those to measurements taken over four days at what remains of Auschwitz. Then members of the jury and the court were given VR headsets and a tour of the camp, complete with the views from the areas where Hanning lived and worked. If Hanning could see how the selection process sent people to the gas chambers to die, then the jury could convict. And when the jury saw Hanning’s views from the tower, it became clear that he must have known that the camp was used to kill people, that his actions contributed to that, and that his actions allowed it to continue. Hanning was found guilty, thanks to a digital recreation of a long-lost site. It should be noted, though, that he appealed this decision and that he died while his case was on appeal. In the German system, that means his case ended on appeal; it did not end with a standing conviction. But VR could help prosecutors make other convictions in the coming years for the atrocities of World War II, so the last Nazi prosecution might not come until the last Nazi accomplice has died.